meta_media lab transforms a festival hub, gallery space or the theater lobby in an mutable interactive lab for experiments on the use of Web 2.0 and mobile portable technology such as: collaborative cloud video production, social networking, post-pc technologies (IPads 2 and I Phones 4), video podcasting, augmented reality (QR code technology and customizable mobile apps) and live video broadcasting. meta_media lab is an experimental space that is deployed within festivals or art events. meta_media lab is a place for innovation on collaborative social media production, digital memory and augmented storytelling with portable mobile technology. meta_media lab explores digital networking of people and ideas as a creative medium. meta_media labs goes beyond the traditional marketing PR approach and explores innovative and creative ways of using the new internet and smart mobile technology as a collaborative and co-creative technologies. meta_media lab participants become a production/RD team experimenting with the potential of digital networked/mobile technologies for augmenting the event web presence/impact, knowledge production and distribution. meta-medial lab offers an excellent opportunity for collaboration between the venues, the local community and other local actors. meta_media lab creates a flexible connected or hybrid space, adaptable for the needs of festival venues, facilitating direct participation of members of the local community as digital journalists and new media researchers investigating digitally augmented knowledge production environments. meta_media lab explores the potential of mobile technologies for the real-time production, broadcasting and interaction of digital content and information streams developing hybrid or augmented spaces with interactive portable multimedia. meta_media lab is a sustainable and collaborative format to produce, distribute and interface networked digital content in the arts. meta_media lab benefit from the dance-tech.tv and dance-tech.net engaged international community of more than 5000 members including individual artists and organizations. meta_media lab use all the dance-tech.net platforms and programs: dance-tech.net, dance-tech.TV and interviews. There is a meta network of high impact and presence in: Facebook, Twitter, YouTube, Livestream, USTREAM and Flickr. meta_media lab in Amber Festival 2010 in Istanbul, Turkey. Special video conferences and remote dialogues with international guests may be scheduled. Screenings of selected high quality content relevant to the event may also be organized as part of the meta_media lab activities. It is conceived as an intervention of the festival or event site creating a "spectacle of information and knowledge" and its production with a collaborative approach. Video excerpts of performances and activities. LIVE broadcasts from venues and mobile stations. Public Lecture on social media and arts. Idea, people mapping and visualizations. The lab is an open and mobile /working /production space with visible monitors and computational portable devices visible for audience ya socializing space. LCD screens fill the space created with tables and benches. Special arrangements can be done to broadcast LIVE relevant festival activities: lectures, performances, panel discussions and after performances sessions. It is a workshop on hybrid storytelling, social media, networked communication and collaborative creativity that takes place in the meta_media production studio. The participants are introduced to the new internet, web 2.0 video production tools and use them to collaborate in the generation and distribution of information and news during the festival or event. They use the lab setting as a space for experimentation on participatory journalism and new social media platforms. 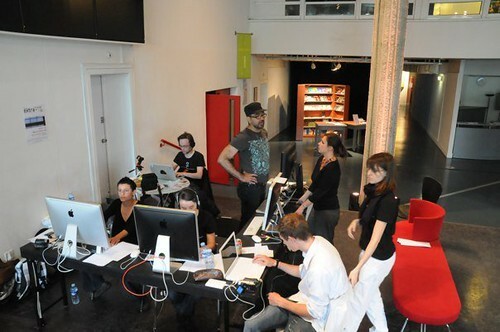 The participants become the media production team of event producing the media and the installations. LOOPS on LCD SCREENS of Produced Content. Upload and display of daily video podcast with interviews and views of the event/activities. All videos will be aggregated on YouTube Playlist dedicated to the event and played on an LCD screen of the space. Produced content will be shared with the hosting venue. dance-tech.tv has partnered with augmented reality mobile app developers Aurasma (UK) for the development of dance-tech.tv AR app wich will be used to augment the printed program/posters and create augmented spaces with digital content from the artists and that is produced in the festival. The printed program will be augmented with video content that will be viewable scanning the images of the programs with a smart phone loaded with the dance-tech.tv app. screenshot of dance-tech.tv card with video overlay viewed with an IPhone running the dance-tech.tv AR app. the dance-tech.tv app will run on smart devices suing a technology that is capable of recognizing images, symbols and objects in the real world and understanding them. It can then deliver digital content in real time, including videos, animations, audio or webpages. The app will work on the iPhone 4, iPhone 4S, iPad 2, iPad3 and more powerful Android devices. Visitors will be able to download the dance-tech.tv AR at the App Store and Google Play. Mobilization, aggregation and visualization Twitter feed on one LCD screen with the hashtag defined by the PR department of the event. Interactive Installation mixes in real time the event twitter feed, photos and images from a local camera taken by the audience (custom software software). This feed may be used in several screens if network available. VIDEO WALL is developed to be deployed online and on LCD screens wall with created videos and other visual material facilitated by venue. EMERGENT MOSAIC Image created with portraits of faces of all the participants. The image may be printed as a poster given away as a unique souvenir of the experience in the event. A video playlist in you tube is created with suggestions of all the participants and visitors of the venue. This aggregates the videos as an idea ecosystem that represents the semantic context of the event. it invited to reflexion and fundamental exchanges. A Word cloud graphic is generated from a a collaborative tagging experience while the visitors participate in an activity or an event. They are asked to write down key words that represent their experience and thy are processed digitally to generate the wordcloud collaboratively created about the experience. The visualization is posted and also printed and given away to te visitors. 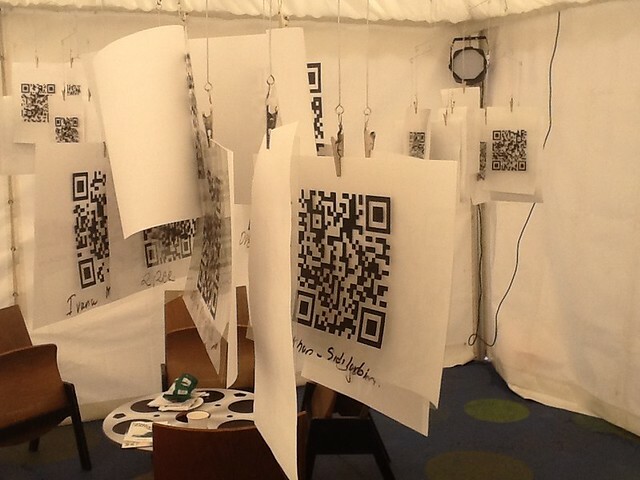 An installation with QR codes evolves during the festival giving access to the produced content via portable devices with QR code scanners. Arts, journalism, new media student and professionals. Arts marketing, PR and audience development specialist. May be led in English and Spanish. An assistant with hight level of new media literacy, knowledge of English and the local language and area is necessary. This person will lead the grid_lab operations after in absence of marlon barrios solano. American Realness 2012, January 2012, New York City, USA. NerjaDanza/Danza Malaga, October 2011, Nerja Spain. Performance Studies International, Utrecht, The Netherlands. NOV_S 2009, Madrid, Spain 2011. Picnic, 09, Amsterdam, The Netherlands.